FRIENDS and family of a young father who was brutally murdered are appealing to families let down by the justice system to join them at a protest in the city centre. 20-year old Christopher Meli was killed in December 2015. 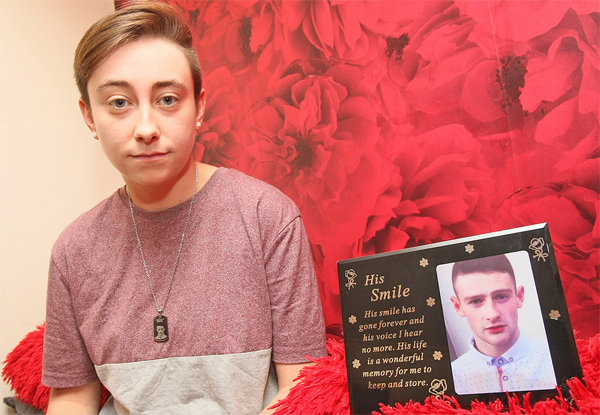 Close friend Rachael Garland, who met “baby-faced” Christopher in Belfast Metropolitan College almost five years ago, is organising the latest protest against the justice system’s handling of the case. She and others are particularly incensed by some of the bail conditions extended to those accused of being involved in the killing. “Ideally we are hoping to get a large turn out of over 100 people,” said Rachael. “We want to show the courts that the people will not take this treatment and that we are not going to go away,” explained the 20-year-old. Detectives believe up to 20 youths were involved in a number of violent confrontations that led to the victim suffering fatal head injuries at Doc’s Lane in the Twinbrook estate. Rachael is urging as many people as possible to attend the peaceful protest for even five minutes to deliver this important message. The protest will be held outside Laganside Court at 12pm on Monday, September 11.